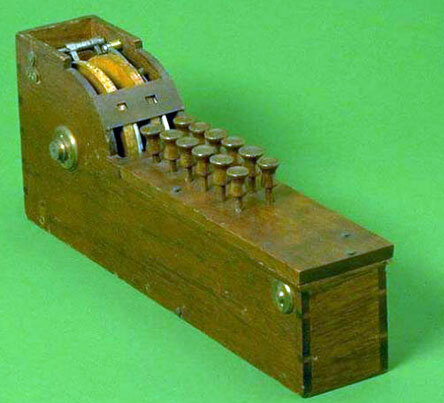 The improved arithmometer of Thomas Hill from 1857 was the first popular key-driven calculating machine, manufactured in the United States (it seems the key-driven adding machine of his compatriot Parmelee from 1850 remained only on paper). 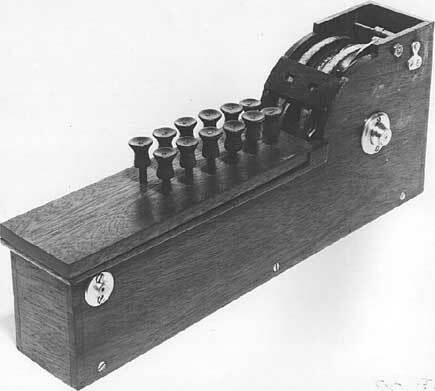 It is fourth (or fifth, since the machine of his compatriot Orlando Lane Castle was patented in the same day) key-driven adding machine in the world, after the machines of Luigi Torchi, Jean-Baptiste Schwilgué and Du Bois D. Parmelee (there is also another earlier patent for a key adder from 1855 (FR24582), granted to the french watchmaker and mechanic Ernest-Narcisse Lobbé, but it remained only on paper). 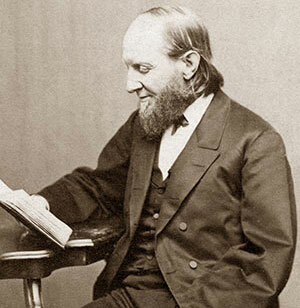 Thomas Hill (1818-1891) of Waltham, Massachusetts, was a Unitarian minister, mathematician, scientist, educator and President of Harvard University from October 6, 1862 to September 30, 1868. He was a man of broad and varied attainments in science and literature, and was also one of the most profound yet brilliant mathematicians in the USA (see biography of Thomas Hill). 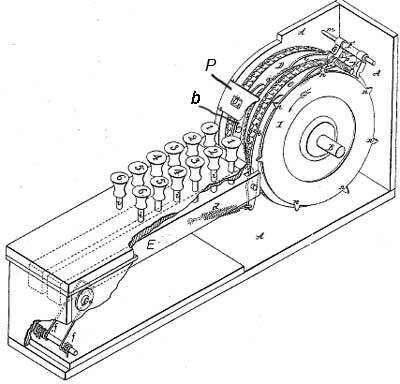 The key-driven calculating machines were already built in Europe (see the the description of the machines of Torchi, Schwilgué, and Schilt), and when Hill heard about them, he decided he would make his own. Hill applied for patent and sent a wooden model to the US patent office (up to 1880, the Patent Office required inventors to submit a model with their patent application). Inventors placed great importance on their models and viewed a well-executed model as the key element in obtaining a patent). The US patent №18692 for an arithmometer was granted on November, 24th, 1857. The patent show two numeral wheels, each having seven sets each of large and small figures running from 1 to 9 and the cipher marked on their periphery. The large sets of figures are arranged for addition or positive calculation, and the small figures are arranged the reverse for subtraction or negative calculation. The wheels are provided with means for the carry of the tens, very similar to that found in the Pascal machine. Each of the two wheels shown are provided with ratchet teeth which correspond in number with the number of figures on the wheel. Spring-pressed, hook-shaped ratchet pawls (marked b in the figure), are arranged to be in constant engagement with the numeral wheels. These pawls are each pivotally mounted in the end of the levers (marked E), which are pivoted at the front end of the casing. The levers E, are held in normal or upward position by springs f, at the front of the machine. Above each of these levers E, are a series of keys which protrude through the casing with their lower ends resting on the levers. There are but six keys shown in the drawing, but the specification claims that a complete set of nine keys may be supplied for each lever. The arrangement and spacing of the keys are such that the greater the value of the key the nearer it is to the fulcrum or pivot of the lever E. The length of the key stem under the head or button of each key is gauged to allow depression of the key, the lever E and pawl b, far enough to cause the numeral wheel to rotate as many numeral places as the value marking on the key. A back-stop pawl for the numeral wheels, (marked p), is mounted on a cross-rod at the top of the machine. But one of these pawls are shown, the shaft and the pawl for the higher wheel being broken away to show the device for transferring the tens to the higher wheel. The transfer device for the carry of the tens is a lever arrangement constructed from a tube F, mounted on the cross-rod m, with arms G and H. Pivoted to the arm G, is a ratchet pawl i, and attached to the pawl is a spring that serves to hold the pawl in engagement with the ratchet of the higher-order numeral wheel, and at the same time, through its attachment with the pawl, holds the lever arms G and H retracted as shown in the drawing. As the lower-order numeral wheel passes any one of its points from 9 to 0, one of the teeth or cam lugs n, on the wheel will move the arm H, of the transfer lever forward, causing the pawl i, to move the higher-order wheel one step to register the accumulation of the tens. The functions of the Hill mechanism would, perhaps, be practical if it were not for the physical law that "bodies set in motion tend to remain in motion". He made no provision for overcoming the lightning-speed momentum that could be given the numeral wheels in his machine through manipulation of the keys, either from direct key-action or indirectly through the carry of the tens. Imagine the sudden whirl his numeral wheel would receive on a quick depression of a key and then consider that he provided no means for stopping these wheels; it is obvious that a correct result could not be obtained by the use of such mechanism. Considerable unearned publicity has been given the Hill invention on account of the patent office model having been placed on exhibit in the National Museum at Washington (at the present time the model is kept in the collection of Smithsonian Institution in Washington). Other key-driven machines were introduced in the following years, in particular by the Americans Leonard Nutz (in 1858) and Joseph Alexander (in 1864), Austrian Friedrich Arzberger (1866), Gilbert Chapin from New York (1870) and David Carroll from Pennsylvania (1876) among others. Changes in these machines led to the first practical key-driven machine—famous Comptometer by Dorr E. Felt, introduced in 1885.